Animal Organizations | "OUR WORLD"
Sign Petition: This Miracle Dog Survived Euthanasia! Can You Help His Friends? Most of us remember the film “Rudy” which tells the story of Daniel “Rudy” Ruettiger who, against all odds, went from being a groundskeeper’s assistant to miraculously playing in one of Notre Dame’s biggest football games of the season. “Rudy” taught us the power of hope and perseverance and touched all of our heartstrings. Recently, another Rudy made headlines, but this time the miracle didn’t happen on the field, rather in the veterinarian’s office instead. Rudolph, a 7 to 8-month-old pup survived the impossible. The young pooch was being kept at a crowded overflow shelter in Oklahoma. The shelter, unfortunately, didn’t have a “no-kill” policy, and because the shelter was too crowded, employees decided Rudolph’s time was up and they put him down. Luckily, the vet didn’t attempt to kill Rudy again. And when news got around that there was a “miracle puppy” in an Oklahoma shelter, the people of King’s Harvest Pet Rescue in Davenport, Iowa, decided to step in and save him. Rudy was taken to Iowa and has already been adopted out. Now he can bring joy to a new family for years to come, and they can’t wait to give him all the love he almost lost out on when he was nearly put to death. Unfortunately, Rudy’s story is so remarkable because most of the times dogs are killed successfully. 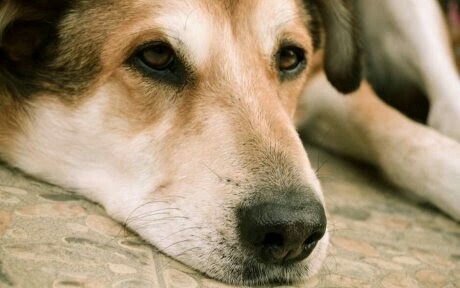 In the United States alone around 2.7 million animals are euthanized each year. That’s almost 7,500 dogs and cats killed every day! This isn’t the way it should be. Animals deserve the to have a long, healthy and loved life, and if kill shelters are allowed to euthanize their rescues whenever convenient, that can’t happen. Care2 wants to challenge the state of Oklahoma and the rest of the state governments to put an end to kill shelters and make every shelter a no-kill shelter. There are better, more humane ways to handle pet overpopulation. It’s time the states did something to make them happen. The average American median household income, calculated in January 2018, is an estimated $59,055, up from an estimate of $58,829 in December 2017. Earlier in 2017 the median income was $61,372 (Keep in mind that there are two kinds of averages. The mean sums up all incomes and divides by the number of people reporting. The median income is the point where half the people make more and half make less. The mean income is usually higher). As you can see in the chart above, households earning over 200k are 5.67 percent of the total US population (tap on image for more information). The Animal Legal Defense Fund has filed a lawsuit against The Farmers Inn, a roadside zoo in Sigel, Pennsylvania, for maintaining animals in squalid conditions in violation of the Endangered Species Act (ESA) and state animal cruelty laws.Many endangered species, along with other animals, are held in grossly deficient conditions at Farmers Inn. These include Queen Louise, a ring-tailed lemur, who despite belonging to a highly social species, is kept alone in a small, filthy cage. Other ESA-protected animals were also found to be confined in cramped cages. These include Russell, a black leopard; Jack and Jill, two black bears; a gray wolf and a hyacinth macaw. Visitors have reported seeing animals at Farmers Inn who are sick and injured. For example, the bears, Jack and Jill, were seen in what appeared to be heat distress on a day where the temperature exceeded 90 degrees. A kinkajou, a small rainforest mammal, was noticed with an injured eye. An emaciated goat, significantly stressed guinea pigs, and foxes suffering from apparently untreated mange were also observed. The Animal Legal Defense Fund previously sent a 60-day notice of intent to sue, a requirement under the ESA. 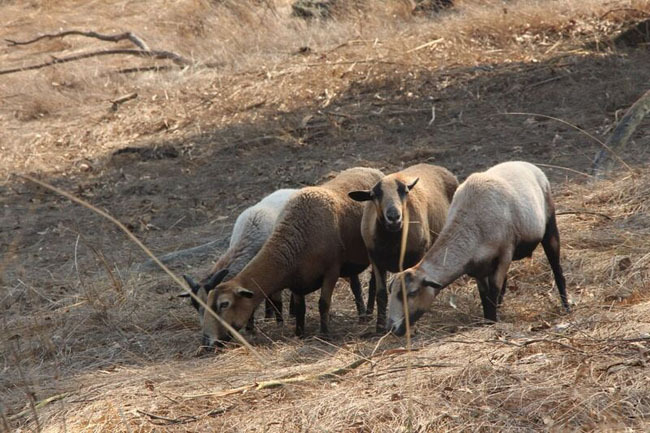 The organization has also offered assistance in transferring the animals held at Farmers Inn to reputable sanctuaries where their unique needs can be met, and they can thrive. Farmers Inn has thus far not responded to the offer. As previously reported by WAN, sadly, the problems at Farmers Inn are not unique. Roadside zoos such as Farmers Inn continue to be able to operate due to lack of enforcement of state and federal animal protection laws. It is with heavy hearts that WAN shares the sad news that Cinder, the inspiring bear who was brought to recover in Idaho after her paws were tragically burned in a wildfire four years ago, was shot dead a little more than one year ago, by a heartless hunter. According to Idaho Black Bear Rehab (IBBR), which cared for Cinder before her release into the wild, the Washington Department of Fish and Wildlife (WDFW) shared the devastating update with the nonprofit organization yesterday. As noted in one of numerous posts on the IBBR’s Facebook page, WDFW explained that the department had recollared Cinder in her den two years after her initial release. When Cinder’s collar stopped transmitting in October 2017, the department believed she was still hibernating in her den. Due to heavy snow in the spring, and the cougar creek fire in the summer, the department was not able to go back and retrieve their cameras until September 2018. Sally Maugan of IBBR shared memories of Cinder, as well as insight into the countless animal rescuers who worked so hard to save her life. IBBR has helped save more that 200 bears over the past 29 years. WAN echoes their appreciation! R.I.P. sweet angel Cinder! It is beyond comprehension that one of the last remaining critically endangered species, a snow leopard, was shot dead last week at The Dudley Zoo in West Midlands, UK. Was there a dangerous escape by the snow leopard? Was the zoo open? Were members of the public on the premises? The answer to the above is an resounding, No! The fact is that the eight-year-old snow leopard, named Margaash, simply wandered out of his enclosure where he resided after a zookeeper left the door open. It wasn’t the snow leopards fault. Despite the snow leopard remaining on the premises which was closed at the time and void of visitors, it was somehow decided by zoo staff to kill the animal because, as the zoo claims, “public safety is of uppermost importance.” What about the protection of the animal forced to live in captivity? Why would the zoo choose to euthanize a critically endangered species instead of tranquilizing it? Outraged animal advocates are now demanding a thorough investigation of the tragic event that sadly occurred on October 23rd but was not announced by the zoo until November 30th. The nonprofit organization addressed that “there will be those who claim that zoos contribute to conservation,” which may, or most-likely may not, be accurate. Wild Animals Do Not Belong In Confinement Nor Should They Ever Be Used For Profit To Satisfy Human Greed! In the wild, snow leopards are generally solitary and secretive cats inhabiting mountainous areas of Central Asia, where males have an average home range of 77 square miles: completely incompatible with life in captivity. According to Defenders of Wildlife, only an estimated 3,500 to 7,000 snow leopards are remaining in the wild, with 600 to 700 held captive at zoos around the world. Born Free is not only calling for an urgent investigation into this incident, it is advocating for the system of licensing and inspection of zoos to be reviewed and overhauled to prevent a similar tragedy in the future. National animal law organization Animal Justice is applauding the Senate for passing Bill S-203, the Ending the Captivity of Whales and Dolphins Act in Canada. If passed, Bill S-203 would outlaw keeping whales and dolphins in tiny concrete tanks for display. After years of delay and obstruction, the legislation passed late on Tuesday evening in a surprise vote, and will now move to the House of Commons where it will be sponsored by Green leader Elizabeth May. Bill S-203 was originally introduced by Senator Wilfred Moore in December 2015, then sponsored by Senator Murray Sinclair after Senator Moore retired. Conservative Senate Whip Don Plett repeatedly used procedural delay tactics to slow down the legislation. Fed up with his efforts to block Bill S-203 from reaching a final vote, MPs from all parties joined Animal Justice and Humane Society International at a press conference in June to call for an end to the stalling tactics. After passing Bill S-203, the Senate also voted in favor of Bill S-238, the Ban on Shark Fin Importation Act, sponsored by Conservative Senator Michael MacDonald. Bill S-238 also has strong support across party lines. Bill S-203 would make it an offence to keep captive, breed, import, or export a whale, dolphin or porpoise. There are exemptions for cetaceans currently in captivity, as well as for rescue and rehabilitation efforts. Bill S-203 was studied for nearly a year by the Fisheries Committee, which heard evidence from countless experts over 17 committee meetings. Only two Canadian facilities still keep whales and dolphins in captivity—Marineland and the Vancouver Aquarium. There is only one surviving dolphin at the Vancouver Aquarium after a spate of deaths, and the facility has publicly committed not to acquire any further cetaceans. The Whale Sanctuary Project plans to build a seaside sanctuary for retired whales and dolphins in Nova Scotia, British Columbia, or Washington. Another heartbreaking case of animal cruelty has resulted in the death of an innocent pit bull in Syracuse, New York. The painfully emaciated dog, named Mavis, may tragically be gone but the sub-human that abhorrently abused her remains at large; and now, there is a $3,000 reward for information that results in the perpetrator’s arrest and conviction. On October 12th, Mavis had exploratory surgery after a foreign body was discovered in an ultrasound. Cuse Pit Crew, which originally rescued Mavis and is offering the reward, also handed out flyers Sunday around Rider Avenue in Syracuse, near where the suffering pit bull was found by a Good Samaritan. This sad case should also create more awareness about the tragic consequences of abuse and neglect of animals. “So, if you see something, say something,” said Stephanie Heath, Cuse Pit Crew founder. Anyone with information about Mavis and her former abuser, or any other tips of suspected animal abuse, should contact the Cuse Pit Crew at (315) 442-5336 or email cusepitcrew@gmail.com. Yesterday, adorable 3 year old deaf Mystique who had just given birth a couple of months ago was killed even though she had several rescues as well as a qualified vet that were willing to save her from being put down by the shelter. Adding insult to injury, a compassionate volunteer who worked at the shelter was fired because she contacted No Kill Coalition as well as several rescues to help save Mystique from being put down. This volunteer had been asked by the shelter to look for someone to take Mystique.Complaining about an animal shelters treatment of animals is a constitutionally protected right. A volunteer, rescuer, or any other member of the public not only has the First Amendment right to speak out, he or she also has a constitutionally protected right to demand that the government correct the wrongs that are identified. All these people should be held accountable for what they did to Mystique!! Petition: No more dogs sacrifices in the Canine Control Centers! A few years ago it was forbidden to kill dogs with electrocution, but we know that in some CCC like that of Tláhuac just a few months ago they have killed hundreds of dogs electrocuting them. They continue to kill them, painfully or without pain, injecting poisons or other things that we do not know they are, without respecting the Laws, they continue to kill them, since hundreds of thousands of animals die every year in these places. We must fight so that there is no longer the sacrifice of dogs in the anti rabies centers of Mexico. We must fight to prohibit the sale of animals, if you want a dog, adopt it. We must fight so that stray dogs are sterilized so that they do not reproduce so their numbers will decrease. We must enforce the Laws so that abusers and murderers pay their crimes with prison. Let’s fight to live in a better country, without sacrificing animals, where they are respected, where they are taken care of and where those who do not pay for it. It happens every year. When hurricanes come to shore and evacuation warnings are given, people pack up and head out in the hopes of avoiding disaster. But as people leave their homes and cities, they sometimes find themselves forced to leave their pets behind. Many of these animals end up in local shelters who quickly become overwhelmed by the sheer number of new pets they had to accept. When a shelter usually reaches capacity, they can often rely on locals to open their homes to homeless cats and dogs. But if the entire city is evacuating because of a storm, fewer people means fewer chances for adoption. That’s just what’s happening now at the Pender County Animal Shelter, an animal rescue organization in North Carolina currently in the path of Hurricane Florence. The shelter says they are overcrowded and may have to begin euthanizing animals to make space. Clearly, for any animal shelter, killing the animals they care for is the last resort, but if no one can take these pets in, or they can’t get the resources they need, they will have no other choice. While North Caroline officials are working hard to ensure their human residents survive the storm, they should also take their feathered and four-legged citizens into consideration as well. One way to do so would be to provide resources to affected county animal shelters, like the one in Pender County, so they don’t have to put down any of the animals they were hoping to save. Please sign this petition and tell Governor Roy Cooper to take immediate action to aid animal shelters in the eye of Hurricane Florence. Together, we can help save hundreds of pets in need. Local Man Seeking to Reinvest in Community Facing Slanderous Opposition from 2 Residents and Town Council. Aladdin Khalifa grew up in Windsor, Ontario in a small downtown house. When he was 19 years old, he left Windsor to pursue his dreams to make it big. Most of his dreams came true , he worked hard in the oil and gas industry, saved his money, met and married his childhood sweetheart, together they have a family with 4 beautiful children ages 2-21 years old. But Aladdin still nursed two dreams – first, to return home and raise his children in the quiet beauty of Essex County, and second, being a dog-lover, to build a “State Of The Art “dog kennel and training facility. Two years ago Aladdin chased his dreams and returned to the Windsor area. In 2016 he bought a house and 50 acres of land in rural Amherstberg and spent millions building his dog facilities, however, two residents are protesting the opening of his facility. These residents allege that the dogs will be noisy, can escape and harm someone, and that the dogs waste will pollute their adjacent properties. Am800 reported that no dog noise is heard on the property, and attested to the fact that Aladdin had built 8 foot steel fences and ground guards around the property so none of his personal pets can escape, or dig under, these fences alone cost a whopping $1.5 million dollars, all of this in good faith and to be a good neighbour. As for the dog waste, Aladdin feeds his dog a homemade specialty raw food diet, kept in a custom-built walk in freezer, that is organic enabling the waste to be composted. In fact, Aladdin has been a generous presence from day 1. He has spent in excess of $7million (seven million dollars) renovating his home and created the “Ritz Carton” of kennels all the while utilizing and employing local contractors. His property and home have more than 24 local people on payroll – and will have more when his dog facility is green lighted . Aladdin has donated to local community events such as the Belle Vue House restoration project ,the Amherstburg’s Harvest Festival, as well as participating in Woofa-Roo. Despite his setbacks he continues to donate to his community as well as keep his staff employed. Aladdin has invited the public and town councilors to visit his property anytime, and he will personally give them a tour on his golf carts. Residents supporting Aladdin have come out in droves on social media. “We need people like Aladdin in this town” said one, while another said “We need a top class dog facility and training.” A third comment read “his dogs can’t get out and anyway they are super friendly. In this country, an escaped horse is way more dangerous and is not kept anywhere near as secure as Aladdin’s friendly dogs”. Aladdin has had more than 500,000 social media followers that check in daily to follow his pups and see them ride the zip lines or run with parachutes attached to there bodies for exercise. I support Aladdin Khalifa’s plan to start his business of a premium dog boarding and training facility on his property in Amherstburg Ontario, and his bringing of jobs and investment into the Amherstburg area. I support the zoning variance allowing 160 metres distance between his property and adjacent properties. A wildfire that began around 11:00 am this morning on Buffalo Mountain, which is west of Silverthorne and north of Frisco, Colorado, has hundreds of people evacuating their homes. The Summit Fire and EMS now estimate the fire size at more than 91acres. Officials have warned that winds were expected to gust to 20 mph on this afternoon, which could fan the fire and cause it to rapidly spread. The growing fire is currently forcing evacuations at the top half of Wildernest and Mesa Cortina. Authorities have set up an evacuation shelter at the Silverthorne Recreation Center at 430 Rainbow Drive in Silverthorne. KKTV has reported that Silverthorne Elementary School, located at 101 Hamilton Creek Road in Silverthorne, will also open as a shelter at 2:00 pm this afternoon. According to the Summit Fire and E.M.S. Facebook page, the Summit County Animal Control and Shelter has set up a hotline for residents who need help retrieving pets left at homes in the area at (970) 668-4143. Authorities are requesting residents do not call 9-1-1. The public hotline number for updates is (970) 668-9730. The county is also frequently updating an emergency blog at http://www.co.summit.co.us/emergencyblog. WAN will update this story as it develops. This 5K obstacle course run/walk on the boardwalk in beautiful Huntington Beach will raise awareness and funds for endangered species. If you are a business that would like to sponsor or an organization that would like a booth, please fill out the contact form or email us at info@generationawakening.org. At the time of registration you choose the organization you would like to run for – that cause will receive 50% of your ticket price. Did you know only 3% of all charitable donations made in the U.S. go to wildlife and environmental conservation? This is not enough, we are failing our wildlife. The time couldn’t be more urgent to take a stand (or a run) and make our voices heard loud and clear that wildlife is important to us, and we need to be doing more to protect them. Come out for a 5K obstacle course fun run on the beach to raise awareness and funds for endangered species and their habitats. Let’s make this the biggest collective RAWR for wildlife! Families, friends, co-workers, kids, and people of all ages can come out to participate in this fun and competitive setting with various contests and prizes. Complimentary water and snacks will be provided. Following the race, enjoy the music by Reggae band Cali Conscious and the various booths, a silent auction and even pet adoptions, as the other players finish. Once the race has concluded there will be an award ceremony for the top finishers (Kids & Adults) and top fundraisers – both individuals and teams, and raffle winners. This will be an exciting day with a purpose that is sure to be a memorable one! pet adoptions and a performance by Cali Conscious! The arm of the U.S. Department of Agriculture known as Wildlife Services killed more than 1.3 million native animals during 2017, according to new data released by the agency last week. The multimillion-dollar federal wildlife-killing program targets wolves, coyotes, cougars, birds and other wild animals for destruction—primarily to benefit the agriculture industry. Of the 2.3 million animals killed in total last year, more than 1.3 million were native wildlife species. According to the latest report, the federal program last year killed 357 gray wolves; 69,041 adult coyotes, plus an unknown number of coyote pups in 393 destroyed dens; 624,845 red-winged blackbirds; 552 black bears; 319 mountain lions; 1,001 bobcats; 675 river otters, including 587 killed “unintentionally”; 3,827 foxes, plus an unknown number of fox pups in 128 dens; and 23,646 beavers. The program also killed 15,933 prairie dogs outright, as well as an unknown number killed in more than 38,452 burrows that were destroyed or fumigated. These figures almost certainly underestimate the actual number of animals killed, as program insiders have revealed that Wildlife Services kills many more animals than it reports. According to the new data, the wildlife-killing program unintentionally killed nearly 3,000 animals last year, including wolves, badgers, bears, bobcats, foxes, muskrats, otters, porcupines, raccoons and turtles. Its killing of nontarget birds included chickadees, bluebirds, cardinals, ducks, eagles, grouse, hawks, herons, swans and owls. Dozens of domestic animals, including pets and livestock, were also killed. Such data reveals the indiscriminate nature of painful leghold traps, strangulation snares, poisons and other methods used by federal agents. “The barbaric, outdated tactics Wildlife Services uses to destroy America’s animals need to end,” Adkins added. “Wolves, bears and other carnivores help balance the web of life where they live. Our government needs to end its pointless cycle of violence. The wildlife-killing program contributed to the decline of gray wolves, Mexican wolves, black-footed ferrets, black-tailed prairie dogs and other imperiled species during the first half of the 1900s and continues to impede their recovery today. Apr 5, 2018 — The City of Dallas filed their initial brief in their appeal of the County’s denial of the City’s argument that Dallas Pets Alive has no right to challenge the order of the municipal court that Rusty be killed. We will submit our response brief on or before April 18. The City may file a reply brief but the Court of Appeals will set a date for the appeal to be submitted to the panel deciding the matter with or without oral argument. Appeals are not like trials in that appeals are decided on the actual written record before the Court and the application of existing law. There is no set time for the Court of Appeals to issue its written opinion. Rusty has been at Dallas Animal Services since Dec. 16, 2017, even though we continue to offer the City of Dallas a positive solution that meets the needs of all parties. Unfortunately, Rusty will remain at Dallas Animal Services while the City of Dallas spends even more taxpayer dollars and City manpower trying every tactic possible to avoid giving Dallas Pets Alive, and really Rusty, due process. While we are not able to visit Rusty, we understand he remains in good spirits as he sits in isolation at Dallas Animal Services. We do not believe Rusty should be there, but we truly appreciate the staff at Dallas Animal Services and all they are able to do for Rusty while the City of Dallas needlessly drags this case out. We know Rusty has appreciated all of the donations he’s received from the #RescueRusty team. If you would like to donate new toys, bones and treats to Rusty, please send them to the address noted below (NOTE: it is a PO box and not a physical location) or drop them off at our adoption event this weekend at Grapevine Craft Brewery from 4-7 p.m. Please keep in mind that Rusty is a chewer, so tough toys are best and toys that occupy his mind and challenge him while he is in his kennel would be appreciated. We do again extend our thanks to Council Members Omar Narvaez and Adam Medrano for their continuing efforts on Rusty’s behalf. They have advocated for Rusty since the beginning and continue to do so. Authorities crashed a dogfight this past weekend in Philadelphia which resulted in the arrest of 14 suspects and the rescue of four dogs. According to The Pennsylvania SPCA (PSPCA), the organization’s Humane Law Enforcement Team broke up the event that was unlawfully taking place in South Philadelphia on Saturday evening. PSPCA Officers and Philadelphia Police officers entered the ring to break up the fight, rescue the dogs, and apprehend the suspects who have not been publically identified yet. Dog fighting crimes hold a felony charge. Drugs, two firearms, a large amount of cash and a wooden fighting ring with blood spatter were subsequently also recovered from the scene. The two pit bull type dogs actively fighting were transported to the PSPCA’s Erie Avenue headquarters where they were immediately rushed to the shelter hospital where veterinary staff began the long work of repairing the damage suffered. 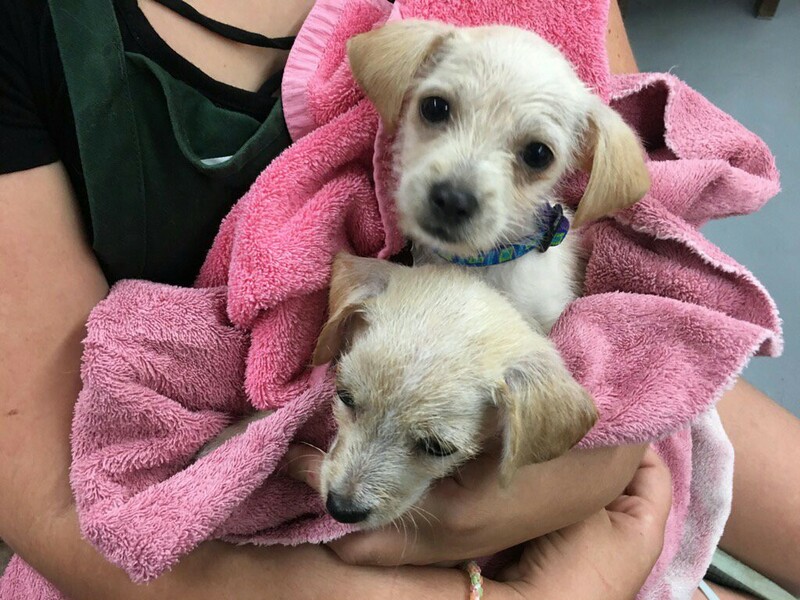 They are both in stable condition and will remain under the custody of the PSPCA until they are signed over by their owners, or the adjudication of their court case. Early Sunday morning, an additional search warrant was executed on a suspect’s vehicle. There, the PSPCA’s Humane Law Enforcement officers found an additional dog, wearing a weighted collar consistent with dog fighting, which was taken into custody. While on location another dog was recovered from a vehicle. This dog appeared ill and was taken to the shelter for medical assessment and treatment. The investigation is open and ongoing. Anyone with information about this case, the whereabouts of those involved, or other cases of animal cruelty, is urged to call the Pennsylvania SPCA’s Cruelty Hotline at (866) 601-SPCA. Tips can be left anonymously. For nearly a decade, the United States Department of Agriculture’s (USDA) Animal and Plant Health Inspection Service (APHIS) housed an online search tool where the public could access inspection reports and legal documentation concerning entities licensed under the Animal Welfare Act. Then, suddenly, in February 2017, the search tool was disabled and the records were no longer accessible to the public, with the USDA claiming privacy concerns as the reason for the documents being removed. It was a shock to organizations and advocates, who relied on the reports to show people the horrors of puppy mills and expose the mistreatment of animals in roadside zoos and other attractions. They also brought to light the number of animals used in research facilities and the conditions in which many were forced to live. The reports showed facility names and locations, the type(s) of animals kept and how many, and recorded any violations of federal law including failure to provide adequate veterinary care and proper food and shelter. They were not only an educational tool, but they also served as evidence in lawsuits and legislative efforts aimed at helping and protecting animals. The USDA has reinstated some of the documentation since the “blackout” that took place just over a year ago, but much of the information organizations rely on has been removed, making the reports virtually useless in their animal protection efforts. In August 2017 a new public search tool was launched and many of the inspection reports were reinstated, but with one major change – the vast majority of information was redacted, meaning you could no longer see animal counts, facility names and locations, and in some cases, the details of what violations were found during an inspection. Many of the search and reporting features have also been disabled in the new search tool, making it more difficult to find information on specific breeders and zoos. Documents can be requested from the agency through the Freedom of Information Act (FOIA), but organizations have reported that those documents were redacted as well, as were any photographs depicting animal welfare violations. Not only that, but long waiting periods to receive the documents can hinder an organization’s ability to protect animals covered under the Animal Welfare Act. For people and organizations working to protect animals by tracking problematic facilities and holding them accountable under the law, this can have a direct impact on their life-saving work and advocacy. 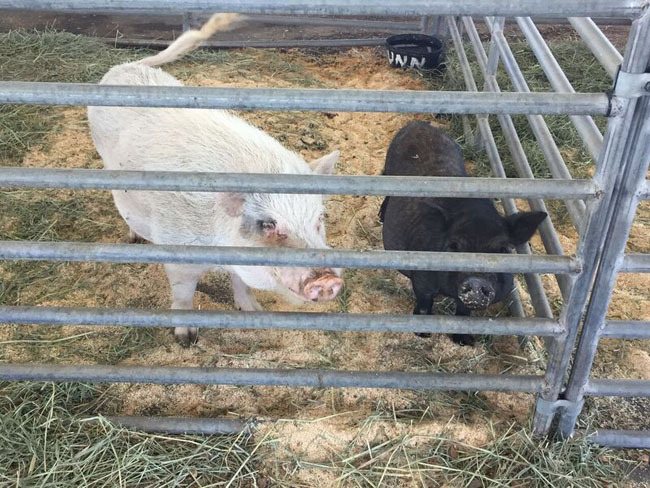 The USDA said they plan to make animal inventories and other information available again in the future, but in the meantime, advocates continue to wait, forced to work with the little information that is available to help protect animals from harm. Countless animal welfare organizations used the inspection reports and other records posted by the USDA to monitor animal welfare violations and track the sizes and conditions of puppy mills, zoos, roadside attractions, aquariums, and research labs. The ASPCA used information from the reports, as well as photographs acquired through the FOIA, to create an online database of problematic breeders and their connections to various pet stores. The Humane Society of the United States (HSUS) used inspection report data to publish their annual “Horrible Hundred” list, which calls out puppy mills who have repeatedly violated the Animal Welfare Act, yet are allowed to remain licensed by the USDA. The USDA reports helped advocates expose the Ringling Brothers and Barnum and Bailey Circus’ multiple violations of the Animal Welfare Act throughout its history, revealing the sad truth behind circuses and animals being used for entertainment. An abusive animal handler who rented animals out for film and television was also exposed because of information made available through USDA inspection reports. Companion Animal Protection Society (CAPS) conducts undercover investigations that have exposed the cruel practices of puppy mills and how pet stores often deceive customers by hiding the truth about where the puppies really come from. Organizations focused on animal law used the reports to fight for legislative change to better protect animals and file cruelty complaints with both state and local agencies when laws had been violated. Without the vital information contained in these reports, each organization’s work to protect animals becomes even harder than it was before. In addition to public outcry over the USDA’s sudden loss of transparency, several organizations decided to take action by filing lawsuits and demanding that the database be brought back online and all of the animal welfare documents restored. 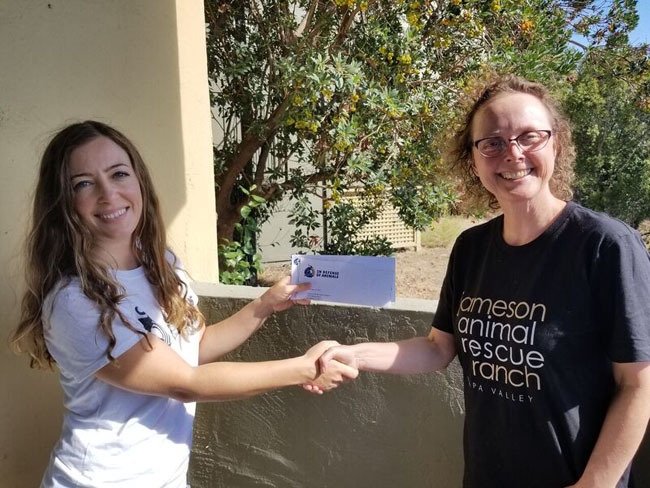 ALDF, an organization focused on using the law to protect animals, understands the importance of these records and how their removal impacts animal welfare organizations throughout the U.S. In 2017, they filed a lawsuit against the USDA along with Stop Animal Exploitation NOW!, Companion Animal Protection Society and Animal Folks, claiming that removal of the documents “violates both the Freedom of Information Act (FOIA) and the Administrative Procedure Act (APA).” The lawsuit was eventually dismissed by a district judge, but ALDF is now appealing that dismissal, according to a press release recently posted on the organization’s website. That same year, PETA, Beagle Freedom Project, Born Free USA and Massachusetts Society for the Prevention of Cruelty to Animals were also part of a lawsuit requesting that animal welfare documents be reinstated and made available to the public. To date, the lawsuit is still pending. These lawsuits will likely continue for some time, so it’s important for advocates to continue demanding that these records be fully reinstated, without redaction, so they can continue their work to protect those who have no voice. As family, friends, and admirers of pilot Bill Kinsinger hold their collective breath waiting for news of his whereabouts after his plane crashed Wednesday while en route to pick up an elderly dog. Tragically, Kinsinger was approximately 20 minutes away from his destination when his plane crashed over the Gulf of Mexico. The kind-hearted Pilots N Paws volunteer was on his way to pick up Masaru, an 11-year-old husky who needed to be taken from Texas to Oklahoma for medical treatment and was just hours from being put down. A Facebook page dedicated to saving Masaru also confirmed that the dog was not on the plane when it went missing. 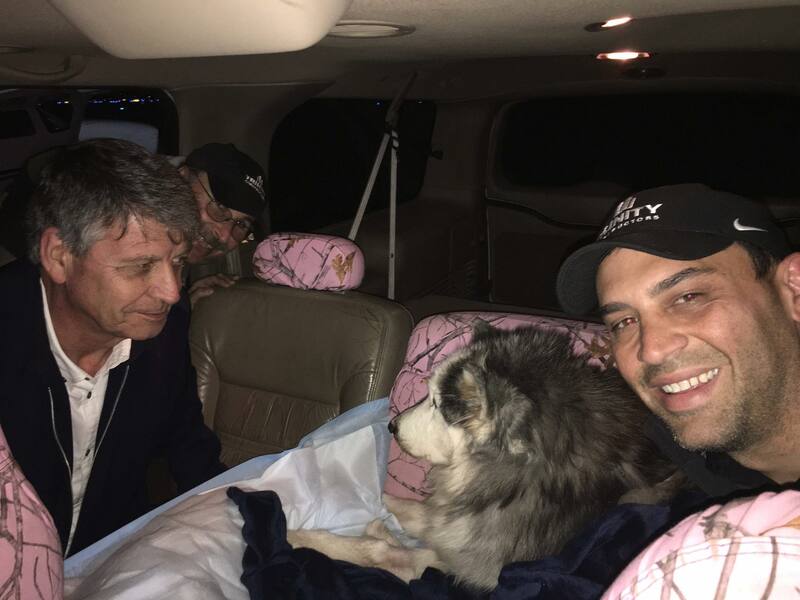 Pilot Justin Blackburn was among several fellow pilots that continued Masaru’s rescue, landing the dog safely at 8:30 p.m. Thursday at Wiley Post Airport in Oklahoma City. 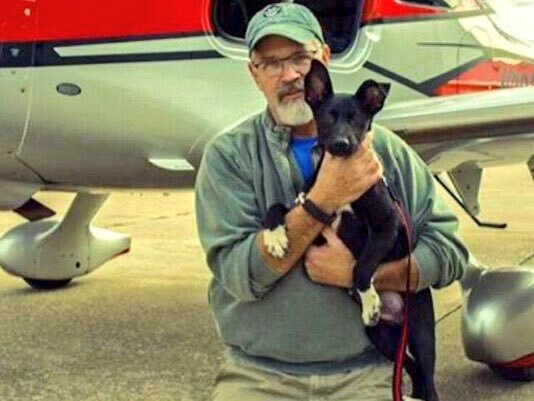 WAN joins Pilots N Paws and countless others in praying for this special man’s safe return. WAN will continue to update this story as the Coast Guard continues to search for Bill over the Pacific Ocean. Lamby is an abused dog facing euthanasia after being seized from her owner. After spending her life stuffed in a crate and being painfully bond with rubber bands that held on sunglasses and hats to encourage passerbuy to donate money. She has been designated a “dangerous dog.” We have a rescue who would like to save and Rehabilitate Lamby, giving her a chance at a nice life with loving family. The most tragic thing about this situation is that she was in the custody of the Dallas Animal Service on five occasions and every time she was turned back over to her abuser, it would be a real failure of Justice if Lamby where to be euthanize now, after so many missed opportunities to give her a better life. We’re asking the city of Dallas to resecind the order to euthanize and release her to the rescue. Please do not let her die voiceless and alone. Give her a chance at a real life and a real home. Thank You… but we still need your help! As thousands of firefighters continue to battle wildfires blazing across California, rescuers are coming together to help save both companion and wild animals affected by the fires. In Defense of Animals (IDA) has offered a harrowing glimpse into the situation with footage that shows horses being rescued from dark clouds of smoke. 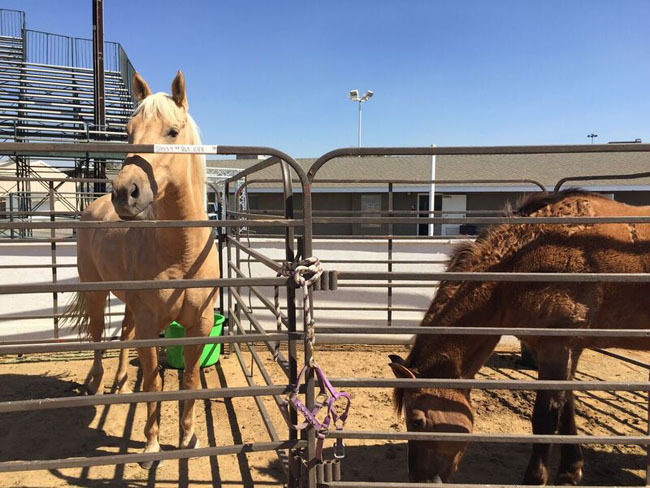 According to IDA, the horses were safely evacuated from Irvine Park to a grocery store parking lot, and were taken from there to an evacuation camp at the Orange County Fairground. The danger in Orange County is over, but many animals were injured and killed, and their homes have been destroyed, while many more are still at risk. 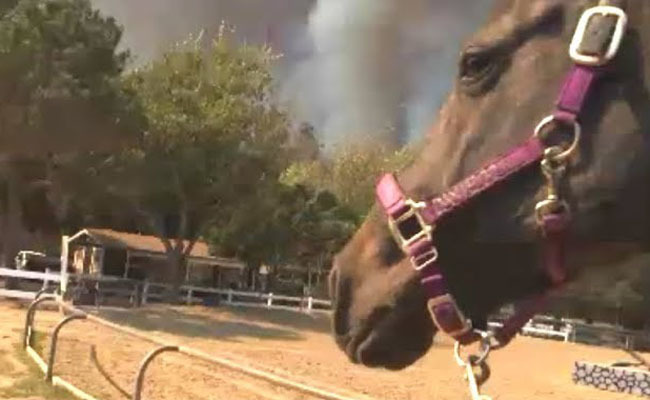 In an effort to help, IDA has teamed up with several local organizations to offer aid through its Disaster Relief Fund, including the Sonoma Humane Society, Lost Hearts & Souls Horse Rescue, Forget Me Not Farm, Sonoma County Wildlife Rescue, Jameson Animal Rescue Ranch, House Rabbit Society and the Otra Mas horse rescue. Despite the heartbreaking losses of life and devastation, people are still coming together and using their time and resources to help some of the most vulnerable victims. 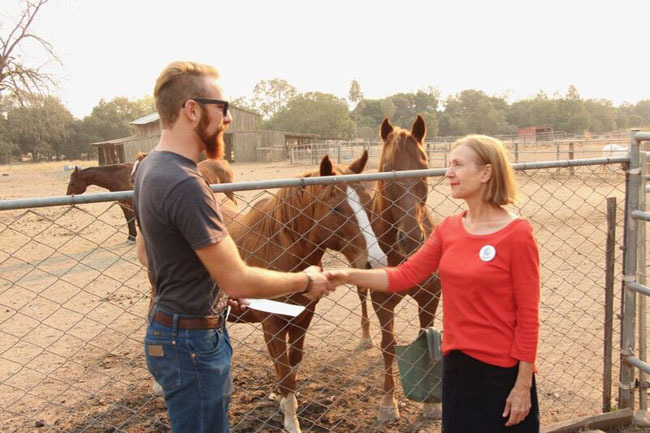 These organizations are taking in a variety of animals who have been displaced by the fires and providing them with care, and some are working to reunite lost pets with their families, and provide services to pets for people who have been hit financially as a result of the fires. “5,700 homes and businesses are reported destroyed, with at least 41 confirmed human deaths and untold animal casualties. 217,000 acres have been consumed by the flames and wild animals have no choice but to simply run as fast as they can from the terrifying blazes consuming their homes. Tens of thousands have perished, and more are injured and need help,” IDA added in a statement. For more on how to help support disaster relief efforts, check out In Defense of Animals. Natural disasters affect humans and animals alike, and Hurricane Harvey is forcing many families to evacuate to emergency shelters, where pets are not permitted due to possible allergic reactions from other people at the shelters. As a result, animal guardians are unwillingly relinquishing their beloved pets to animal shelters. Austin Pets Alive! (APA! ), an animal rescue in Austin, Texas, is working hard to keep up with the growing animal shelter populations, and as of this past Saturday, they have transported 235 animals to their shelter, and they anticipate many more. APA! says they are humbled by the outpouring of support they have received, but they still need more assistance, and they are asking you for your help to save and care for these frightened and displaced animals who have been tragically separated from their families. Due to the generous donations they have already received, APA! is running out of storage space for crates, bags of dry food, and other large items. They are asking for financial donations in lieu of these items, which will allow them to allocate funds as needed. If you are able, you can donate to APA! here. If you are in the Austin area, they will also accept donations of flea and tick treatment, bedding, and treats. If you cannot make a financial contribution, you can help save these innocent lives by volunteering as a foster or adopting one of these animals. Fostering truly does save lives, and APA! is asking for volunteers who will be able to commit to fostering until the animals are adopted to forever homes. To learn more about fostering or adopting through APA!, visit here. There is great power in a community joining together for a common good, so please share this with your network to help gain more support for the victims of Hurricane Harvey.